The state Supreme Court today bypassed the Court of Appeals and took five controversial cases for direct review, exercising its rarely-used discretion and raising eyebrows over the timing, with contentious partisan elections soon getting underway. The high court took those cases despite having yet to render opinions in several high-profile cases — including the redistricting case, which has been pending since argument in January, and two cases concerning the Racial Justice Act, pending since argument in April. 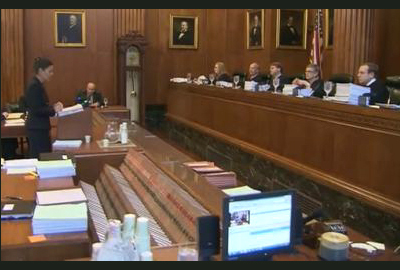 The case had just gotten underway in the Court of Appeals before the Supreme Court’s order today. Cape Fear River Watch v. N.C. Environmental Management Commission: This is Duke Energy’s appeal of Superior Court Judge Paul Ridgeway’s March ruling requiring the company to immediately eliminate the source of groundwater contamination at its coal ash pits — in advance of any clean-up plans it might later adopt. In its opening brief in the Court of Appeals, Duke Energy argues that the Coal Ash Management Act passed by the General Assembly in August overruled the lower court’s decision. Fisher v. Flue-Cured Tobacco Cooperative Stabilization (U.S. Tobacco Cooperative): This is an appeal of the certification of a class comprised of some 800,000 past and present tobacco farmers (per U.S. Tobacco Co-op’s brief) claiming to be entitled to and seeking payment from a $340 million reserve fund held and maintained by the cooperative. Arnesen v. Rivers Edge Golf Club: Five cases are consolidated in this appeal, in which purchasers of vacant lots in Brunswick County sued the developer, mortgage broker, appraisers, attorneys, and BBT Bank, alleging a scheme to sell the lots at artificially inflated prices through “high-pressure, misleading sales tactics, fruadulent appraisals, unscrupulous lending practice and other conduct.” Purchasers of the lots are appealing orders from the Business Court dismissing certain claims and defendants.